In case you missed it, simple utilitarian chic is everywhere in menswear of late, and with rainy days on their way, we’re welcoming the resurgence of goods built to last. Spearheading the charge, Los Angeles-based Killspencer creates tough-as-nails backpacks, duffels, and messenger bags made from recycled military truck tarps and coated cotton canvas that are sleek and refined enough to tote around the city. Each bag was made by hand, features top-of-the-line hardware, and will probably outlast you. Killspencer was founded by Spencer Nikosey upon graduating from L.A.’s Art Center College of Design. Throughout his current collection, Nikosey gets down to brass tacks with two eco tacts: the use of recycled materials and the creation of durable heirloom goods that are sure to withstand the test of time. The current Killspencer line consists of three collections. The Repurposed Collection consists of bags that have been reclaimed from “used in combat” truck tarps. These heirloom goods are waterproof, individually numbered, and feature authentic wear and tear from their past lives. The Historical Reserve Collection is constructed from aged coated cotton canvas that has been well preserved—in some cases for nearly 60 years. The Classic Collection is newly crafted from high-tech perfomance materials, and what these bags lack in historic wear and tear, they make up for in durability. The beauty of the Killspencer collection is in the details. Throughout the entire line it’s clear that Nikosey carefully considered the fit and form of his bags, from the striking matte-black finishes to the high-quality waterproof zippers that lock out the elements. Despite the self-effacing moniker, we’re thrilled to see Spencer’s salvaged collection is alive and well. $400 for a backpack? really? In case you missed it, simple utilitarian chic is everywhere in menswear of late, and with rainy days on their way, we're welcoming the resurgence of goods built to last. 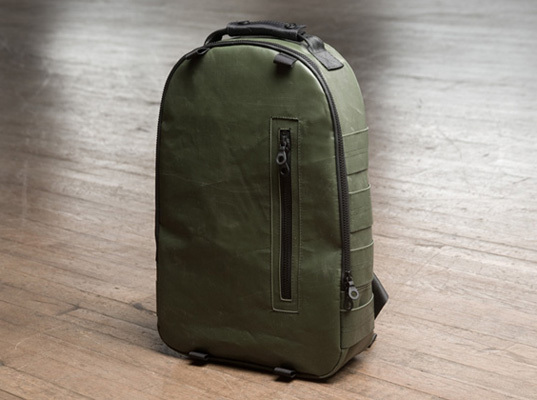 Spearheading the charge, Los Angeles-based Killspencer creates tough-as-nails backpacks, duffels, and messenger bags made from recycled military truck tarps and coated cotton canvas that are sleek and refined enough to tote around the city. Each bag was made by hand, features top-of-the-line hardware, and will probably outlast you.